In just a few short years drones have gone from novelty to nuisance, swarming local events and crashing into apartment buildings. But don’t pull out your old Little League bat just yet– drones can also be great tools for filmmakers. As any Casey Neistat fan can tell you, you can get some jaw-dropping shots with even a low-priced model, a smart phone, and some spare time. Drones– amongst the most controversial technology of our time– as weapons, tools, and toys have given us the opportunity to see things through a new pair of eyes. Curators at Knockdown Center spent months recruiting a bunch of artists to utilize drones in relation to art work, however that may be interpreted.Visitors will have a chance to fly the drones themselves through various obstacle course-like installations and engage with them in participatory performance art like Cara Francis’ Remote in which the artist’s drone interrogates then dances with volunteers. Special performances are scheduled throughout the exhibition’s tenure. Actually, the future is still a few months away. But get ready anyway coz both of these fests are expected to sell out. Almost any fool with a smartphone and a computer can make a movie nowadays, and as the medium has grown more accessible, communities of niche filmmakers and cinema fans have flourished as well. As to be expected, the rewards for seekers of bizarre and innovative films are endless. While we haven’t yet been able to load cameras onto the Magic School Bus and capture photosynthesis or something, science and tech nerds can still rejoice at the nearly-as-rad achievements at these approaching film fests. Speaking of drones, at least one tried to go AWOL at Internet Week. It happened when a group of seemingly innocent high schoolers from the Flatiron School programmed a couple of drones to do a special little dance to the theme song from Knight Rider. 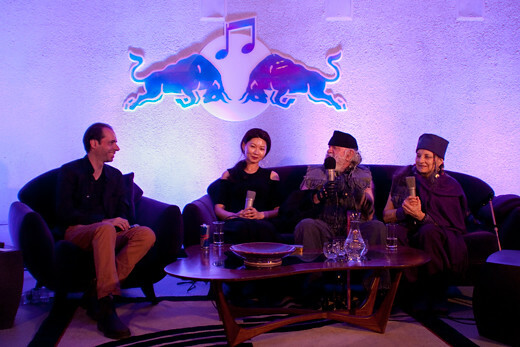 La Monte Young, the minimalist master whose trailblazing work with droning has influenced everyone from the Velvet Underground to Sonic Youth to Brian Eno, who once called him “the daddy of us all,” made a rare public appearance at Red Bull Studios on Thursday, dropping some tantalizing details about a new Dream House installment coming in June to Dia:Chelsea. The self-declared “graffiti vandal” known for his signature skull icon and for using paint-filled fire extinguishers to throw up giant versions of his ubiquitous KATSU tag is getting his first solo show at The Hole.